With the cold weather now upon us, photographing garments for my shop is no longer possible to do outside. My house doesn't have any good spots for photographs so I was in need of a photo backdrop. I went to a couple camera stores and was shocked how expensive most photo backdrops were. The only one I liked was $170. Yikes! Luckily I'm rather resourceful and made my own for under $30. The best part of this backdrop is that is can be hung from any curtain rod. Which again saves a lot of money (the backdrop stands I saw started at $200). 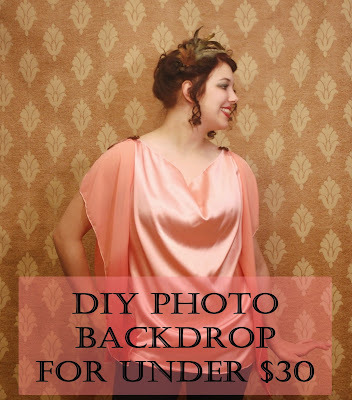 I did my photoshoot in my parents family room and hung the backdrop from the rod above the window. My only complaint about the set-up was the lighting but that was entirely to do with my rather pathetic old camera lights (I reeeeeeally need new ones). The fabric you choose for your backdrop should be an upholstery or drapery fabric. They are wider and made of a thicker weight of material. I bought mine from the sale section of my local fabric store and the final cost was about $25. Neutral fabrics are the most versatile but fabric in a fancy colour could look really great depending on what you are photographing. However try to avoid busy patterns that will detract too much from what you are photographing! 1) Finish the top and bottom edges of your fabric. You could do a fancy hem, but I just pulled the last few rows of threads out to make a fringe. This part shouldn't be visible in your photographs so it doesn't need to be too neat. 2) Sew the center of ties to the top of the fabric. Place one on each end and one in the middle. Make sure it is well secured. One of the corner ties. And that's pretty much it. To put up your background, just tie the ties around the rod. Happy photographing!